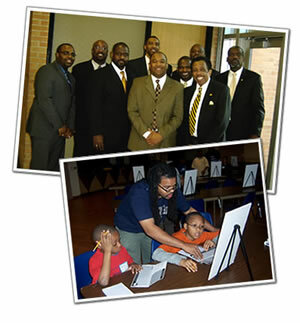 Founded September 27, 2000, BMAD is the vision of Norman C. Hurns, a public school teacher. The realization of the void that exists because of social, political and economic situations in today’s young males experiences sparked the vision for BMAD. The initial group of 21 young men were students at Mumford High School in Detroit, MI. In 2006, BMAD began operating under a formal structure and as a non-profit organization under Internal Revenue Service Code 501(c)(3). Under the new structure, BMAD will focus on young men age 6-9 years old to create a strong foundation in young men prior to the pivotal and challenging years of middle school. With intense focus and strategic direction, the organization will continue to focus on three principles with plans for both a summer and after-school program. All programs and activities will focus on the organization’s principles which will be delivered through three program areas that are integrated with life skills and character development activities. BMAD has supported several organizations through community outreach: City of Detroit, Karmanos Cancer Institute, Toys for Tots, YMCA/Women Shelter Initiatives, Adopt-a-Family.